I am a proud military spouse. My husband has served as an officer in the navy for more than ten years now. I always knew there would be absences. I am a very independent woman and, frankly, I wasn’t worried about it. Until we had our son Mason. Then I practically begged him to never leave me again! Luckily for me my husband was home when Mason was born and didn’t have to sail until he was a few weeks old, and only for three weeks that time. But it was still tough. Mason is five now and thankfully for us its only been twice his Dad has had to go away for a few months at a time to sea or on a course for his job. But it is still tough to have you and your child’s entire world turned upside down...and that’s just what happens the moment they walk out the door. I have friends who’s husbands travel often for work and my brother works far away in a camp for two weeks and then is only home for one week before he has to leave again. It is a tough gig being a single parent and I bow down to those who do it full time! For the rest of us it is tough to be without your ‘right hand’ for weeks or months at a time. Thankfully I’ve learned a few tricks along the way. Being a military spouse I make full use of my Military Family Resource Center. I got to know the services offered to me and to my children. The child minding saved my sanity and saved Mason from having a raving lunatic for a mother too! 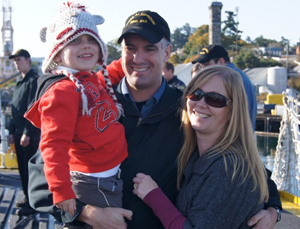 If a spouse is deployed they offer workshops for at home spouses and children and each ship also has a family network that gets the families together regularly. I found doing activities with the other spouses helped a lot because they fully understood what we were going through. You know those friends/family that say they are going to help you? They may forgetand get on with their own lives. Call them up! Never be afraid to ask for help. Very often people want to do something for you but have no idea how to help you. Give them lots of ideas! One of my friends used to come over once a week and have a glass of wine with me after Mason went to bed. Having that adult time was so important for me and I can’t even express how much I looked forward to it. Reach out to others facing the same situation. I’ve learned my best survival skills fromother military wives. Get to know other people thriving alone and learn from them. Get out by yourself sometimes. Luckily for me I was able to access free child minding twice a week for a few hours each time. Whether I used it to relax or do housework it didn’t matter...it was QUIET child-free time! If you aren’t military find someone willing to take your child off of your hands at least once or twice a week. You really do need it. If you don’t have anyone that will do it for you hire a sitter if you can afford it or even trade babysitting with a friend. Have a ton of meals in the freezer. I made enough so that at least once a week I had a meal that was easy and was big enough for leftovers the next day. And if people want to help you, ask for food - especially from anyone you know who loves to cook or bake. Do as much pre-prepping as you can. Make lunches the evening before. Have the coffee and water in the pot so in the morning you just have to press the button to turn it on - having coffee available first thing is a necessity in my house! Don’t take on too much and learn to say no. People around you may not understand but when my spouse is away I live in survival mode and anything not vital to my family’s survival goes by the wayside. If too much is placed on my poor fried brain then things start to fall out, so give your brain a break and only deal with things you have to. My final tip, and it has saved me many times, is to not do anything after 8:30 every evening. It may mean that you are running around like a mad woman between dinner and the kids’ bedtime but when your spouse is away and you are EVERYTHING you physically and emotionally need some down time every day. I can’t sleep if I don’t rest my body and my brain every night. Have a bubble bath, read a book, vegetate in front of the tv. As long as it doesn’t involve doing something for someone else it will help you cope. days would be gut wrenching for me. So after you make sure your spouse is bringing you home LOTS of great presents, cut them some slack and understand that they are going through a separation too. Jennifer Hawke has worked in childcare and the dental field. She is now a stay at home mom to two boys and a proud navy wife.